Can delayed C-section cause brain damage and hypoxic-ischemic encephalopathy (HIE)? Can delayed C-section cause brain damage and hypoxic-ischemic encephalopathy (HIE)? Can a delayed C-section cause brain damage and hypoxic-ischemic encephalopathy (HIE)? Yes, delayed C-section deliveries can cause brain damage, hypoxic-ischemic encephalopathy (HIE), cerebral palsy, and other birth injuries in a baby. When medical personnel spend too much time attempting to deliver a baby vaginally, babies are often left in oxygen-depriving conditions. Periods of fetal oxygen deprivation occurring before, during, or just after delivery often cause permanent infant brain injuries. Medical professionals must act quickly upon signs of fetal oxygen deprivation because physicians cannot directly help babies with oxygenation, ventilation, or circulation when the baby is inside the womb. Often, the fastest and safest way to deliver a baby is by ordering and performing an emergency C-section. The best way to detect fetal oxygen deprivation in a baby still inside the mother’s womb is to closely monitor the fetal heart rate. The fetal heart rate tones show up as a tracing on a graph and are known as fetal heart tracings. The fetal heart rate monitor shows the baby’s heart rate in response to the mother’s contractions. Clinicians skilled in fetal heart tracing interpretation must be present during labor and delivery, especially if the pregnancy or labor is high-risk. When a baby becomes oxygen deprived, the fetal heart tracing will be abnormal or nonreassuring, and this information is usually the only indication that a baby is not receiving enough oxygen. The physician and medical team must closely monitor the mother and baby during labor and delivery in order to notice dangerous conditions before they become so severe that the oxygen deprivation causes a change in the baby’s heart rate. These changes to the baby’s heart rate are known as fetal distress. A number of conditions, complications, and situations can result in fetal oxygen deprivation and necessitate an emergency C-section delivery. In this section, we’ll discuss some of the pregnancy, labor and delivery situations that often require planned or emergency C-section delivery. When a baby is in an abnormal position (malpresentation) when labor begins, it can be very dangerous. Face and breech presentations are some examples of fetal malpresentation. Malpresentation can cause prolonged labor, which is associated with oxygen deprivation and fetal distress. In addition, malpresentation is associated with umbilical cord problems (also see below for more information on this). The physician must closely monitor the mother and baby and have the skill to notice when a baby is in an abnormal position. During any delivery, it is imperative to have the capacity to quickly move on to an emergency C-section. When the baby is malpositioned, everything must be in place for the physician to quickly perform a C-section. In fact, in most cases of face presentation, the baby must be delivered by C-section. When a baby is in a breech presentation, the physician can attempt to rotate the baby into a normal position, but these maneuvers require a lot of skill, and they are time-consuming. Thus, when breech presentation occurs, it often is safer to deliver the baby by C-section. It is important to remember that prolonged labor is associated with oxygen deprivation and fetal distress. The umbilical cord is the baby’s connection to oxygen-rich blood coming from the mother. If the umbilical cord becomes completely compressed, the baby will not receive any oxygen. Face presentation is associated with multiple nuchal cords, which means that the cord is wrapped around the baby’s neck more than once. This can cause the cord to be compressed, thereby reducing the flow of oxygen-rich blood to the baby. A nuchal cord can also be so tight that it pushes on the vessels in the baby’s neck, restricting blood flow to the baby’s brain. Breech presentation is associated with nuchal cord and a prolapsed umbilical cord, which is when the cord exits the birth canal in front of the baby. A prolapsed cord becomes compressed by the baby’s body, which can severely or completely cut off the flow of oxygen-rich blood to the baby. When umbilical cords become compressed, babies must be delivered immediately to avoid hypoxic-ischemic encephalopathy (HIE) and death. Cephalopelvic disproportion (CPD) is a pregnancy complication in which the fetus’s head is too large to easily pass through the mother’s pelvis. Medical personnel must measure the mother’s pelvis at her first prenatal visit. Then, the physician must pay close attention to the baby, so the medical team can determine if the baby will be too large to fit through the birth canal. If the mother’s pelvis is small, an average sized baby may not fit. Sometimes the baby becomes macrosomic (large) due to gestational diabetes or other factors. Whatever the reason, if the baby cannot or is not likely to fit through the birth canal, the physician must discuss the option of a scheduled C-section delivery with the mother; the risks and benefits of all delivery options must be thoroughly discussed. It is crucial for the physician to be aware of the presence of CPD because it can be very dangerous to attempt vaginal delivery when CPD is present. Firstly, trying to vaginally deliver a baby that cannot fit through the birth canal causes labor to be prolonged, which can cause fetal distress. Secondly, when labor is prolonged, physicians may be tempted to use risky delivery techniques, such as the use of forceps or vacuum extractors, which greatly increases the chance of the baby suffering from an intracranial hemorrhage (brain bleed) and resultant hypoxic-ischemic encephalopathy (HIE). Oftentimes, physicians spend too much time trying to use these risky instruments instead of quickly moving on to an emergency C-section. Physicians may also use the labor induction drugs Pitocin or Cytotec to speed up delivery. These drugs can cause contractions to be so strong and fast the baby becomes deprived of oxygen. Like forceps and vacuum extractors, if the baby is not going to fit through the birth canal, using devices to speed up labor will only delay the ordering and performance of a C-section delivery. If labor induction drugs cause a hypertonic uterus–which is characterized by excessive contractions of the uterus–the baby must immediately be delivered by C-section. This is because hypertonic uterine contractions can cause the oxygen deprivation in a baby to become progressively worse. 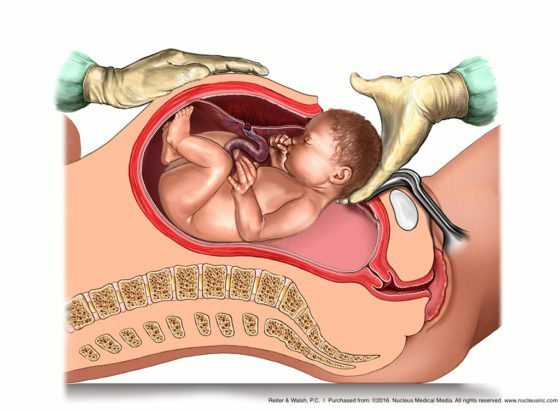 Placental abruption is a pregnancy complication in which the placenta becomes either partially or completely separated from the uterus. Placental abruption is dangerous because the placenta connects the fetus to the womb (uterus). If the placenta becomes completely separated from the womb, the baby will be totally cut off from the mother’s blood vessels, which means no oxygen-rich blood from the mother will be able to enter the placenta and travel to the umbilical cord and then to the baby. In the case of a complete abruption, the baby must be delivered by emergency C-section in a matter of minutes. If the abruption is a partial one, the physician should still be prepared to perform an emergency C-section because a partial abruption can turn into a complete or severe abruption very quickly. The urgency of the delivery depends on multiple factors, including the location of the placental separation, the length of time of the separation, the age of the baby and the amount of reserve the baby has. The mother and baby must be closely monitored when any type of abruption is present; the fetal heart monitor can notify the physician of fetal distress. Failure to quickly deliver a baby when placental abruption is severe can cause oxygen deprivation and hypoxic-ischemic encephalopathy (HIE). The mother loses so much blood (low blood volume and blood pressure) that not enough oxygen-carrying blood can be delivered from her to the baby through the umbilical cord. The rupture causes the placenta to be cut off from circulation, which means the umbilical cord cannot deliver oxygen to the baby. Complete deprivation of oxygen is common in cases of uterine rupture, and fetal or neonatal death occur quite often in cases of a complete rupture. An emergency C-section is mandatory when rupture occurs due to the potentially devastating consequences of the condition. Hemorrhagic placenta previa is typically characterized by painless third trimester bleeding. Often, bleeding occurs with the cervical changes and related uterine contractions that naturally occur as the pregnancy advances through the third trimester. As a result, when the cervical opening becomes wider and/or uterine activity occurs, the placenta previa can become hemorrhagic, causing the mother – and sometimes the baby – to hemorrhage (bleed suddenly and profusely). Because of this, the physician must closely monitor a mother diagnosed with complete placenta previa and the physician usually must deliver the baby by C-section well before the time when any uterine activity or related cervical changes are likely to occur. Since a complete placenta previa covers the cervical opening, vaginal delivery can never be safely attempted. It has long been recognized that placenta previa may cause life-threatening hemorrhage in less than fifteen minutes and that the amount or extent of hemorrhage associated with placenta previa is often unpredictable. Furthermore, because a baby’s circulating blood volume is so low, fetal hemorrhage associated with placenta previa is particularly dangerous and may lead to the baby’s death or HIE and severe brain damage if not properly managed. Preeclampsia is a maternal health condition occurring during pregnancy that is characterized by high blood pressure and protein in the urine. Preeclampsia can be classified as being mild, moderate, or severe. In many cases, a mother with mild preeclampsia can rapidly progress to a more severe form. When preeclampsia is undiagnosed or untreated, there are significant risks to the baby. Preeclampsia causes blood vessel problems in the placenta, which can cause a decrease in the flow of oxygen-rich blood from the placenta to the baby. A physician caring for a mother with preeclampsia must conduct thorough maternal evaluations to continually assess the extent of the disease. In addition, the physician must initiate a regimen of fetal surveillance to determine what effects the preeclampsia may be having on the baby. Due to the extreme risks associated with even mild to moderate preeclampsia, many physicians deliver the baby prior to term. Preeclampsia can sometimes occur (or “show up”) during labor and delivery. Thus, it is crucial that physicians closely and skillfully watch the fetal heart monitor so that the baby can be quickly delivered by emergency C-section at the first signs of oxygen deprivation and fetal distress. Physicians must also pay close attention to the mother’s blood pressure during labor and delivery, especially if she has risk factors for preeclampsia. Preeclampsia is associated with placental abruption. As discussed earlier, if an emergency C-section isn’t performed when a severe abruption occurs, the baby can develop HIE. Physicians and the medical team must skillfully and continuously review the fetal heart tracings throughout labor and delivery to ensure that fetal heart tones are reassuring and the baby is receiving sufficient oxygen. If non-reassuring fetal heart tracings occur, prompt and appropriate actions must be taken. These actions may include the administration of oxygen, fluids, and medication to the mother. More often, however, an emergency C-section is required in order to quickly remove the baby from the conditions causing the oxygen deprivation. An emergency C-section should be performed within 10-18 minutes, depending on the circumstance, and sometimes sooner. Physicians must continuously monitor the mother and baby and be aware of any problems that may necessitate delivery via emergency C-section. Medical professionals should quickly deliver a baby before there is severe oxygen deprivation, and this means they must be able to promptly diagnose the conditions listed above. It is crucial for physicians to avoid vaginal delivery when it is not possible or when it is dangerous to the mother and/or baby. This requires skill and very close assessment of the mother and baby. Not only must physicians be prepared for a C-section delivery, but they must also closely monitor the baby’s heart rate. If a physician or team member ignores the fetal monitor tracings, misinterprets the tracings, or fails to quickly deliver the baby by C-section and the baby develops HIE, it is medical malpractice. If your child has hypoxic-ischemic encephalopathy or any other birth or brain injury, contact the trusted birth injury lawyers from Reiter & Walsh ABC Law Centers. Our award-winning attorneys will review the medical records and determine if negligence occurred. If your child was injured due to medical malpractice, we will fight to win the money your child deserves for medical care and a secure future. We serve clients throughout the nation and never charge any fees until we win your case. View our video library to see Michigan delayed C-section lawyers Jesse Reiter & Rebecca Walsh discuss causes of and treatments for cerebral palsy and other birth injuries.